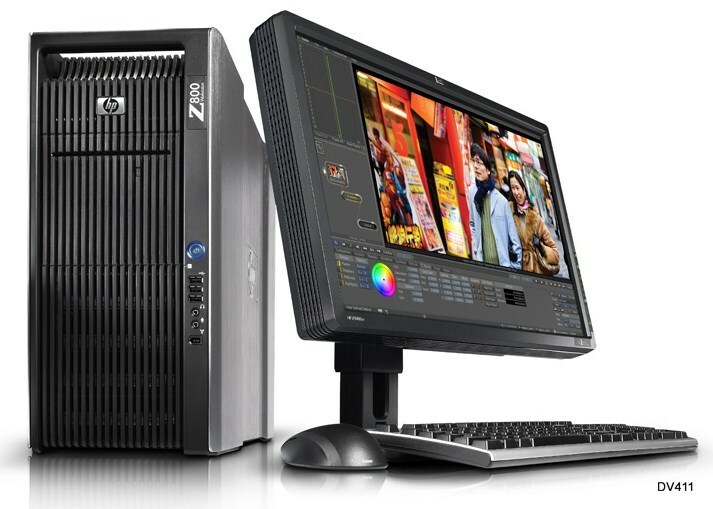 HP Z800 has a rather subdued exterior. It doesn't manifest its power by chrome accents, edgy or flashy design. Yet its heft and build quality manifest themselves even before you pop the cover open to peer inside. And then you are really in awe. Ever peaked under the hood of a BMW M6? That's what Z800's inside looks like. CPU/memory and card bays have separate plastic covers and are compartmentalized for efficient airflow. Hard drives are in removable trays on a backplane. Which means no wires or cables. In fact very few cables are visible - a huge departure from its predecessor xw8600. The Z800 is the only system that is better designed than a Mac Pro. Finally, someone did it. The unusually shaped power supply at the top can be removed and swapped without any tools, much like almost anything else in this system: aside from CPU heat sinks, everything is tool-less. Yes even the hard drive trays. Among other features are gobs of RAM, PCIe slots, SAS and SATA ports, RAID5 on SATA ports. HP on-site support, its responsiveness and quality are also unmatched. The Z800 leaps not only over its predecessors the xw8600 and xw9400 in design, features and power, but also over competitors. There is nothing like the Z800 in the market. Not from Dell, not from Lenovo, not from Apple, not from custom system integrators. Can Z800 stand improvement? Of course - I have a shortlist. If you do, post a comment. Noise: not as quiet as a Mac Pro. Z800 is still practically silent, even under load, despite all of its 8 to 10 fans. Mac Pro only has 3 or 4 larger ones which spin at slower speeds and therefore generate less noise. Granted, Mac Pro is radically more limited than Z800 on PCIe slots, available power, RAM and storage expansion - but still, a part of me wishes the Z800 could be as silent as the Mac Pro. Hard drive activity lights. You can put up to six 3.5" drives in a Z800, four of them into swappable bays connected to the SAS backplane. However there is only one HDD activity light for all of them. A hard drive that is about to die or has problems, often has much more activity than it should. Having an individual activity light for each hard drive would make it much easier to trouble-shoot and diagnose. On HP servers, there are two diagnostic lights for each drive bay - for a good reason. Storage expandability: there is room for more! There are 14 hard disk connectors on the motherboard (8 SAS, 6 SATA), but room for only 6 drives, 4 of them on a SAS backplane. How about an option for 8-10 SFF drives vs. 4 LFF ones? Save for a few very minor gripes, HP Z800 is today's best workstation, the top dog, unmatched by anyone else.